Zanzibar is an island off the coast of east Africa that, with mainland Tanganyika, formed the United Republic of Tanzania in 1964. For centuries, the island, known locally as Unguja, was an important stop on trade routes between India, the Middle East, and Africa, and its people, architecture, customs, and performing and creative arts bespeak a heady mix of cultures. Likewise contrasted on the island today are what might be seen as the traditional ways of life and the more modern conveniences arrayed for the global tourist. Thus while the island boasts more than its share of Internet cafes and T-shirt shops, it lacks a single ATM; while world-class scuba diving is available, perhaps the most frequent diversions for out-of-town visitors are spice tours; and while up-to-date resorts line its eastern coast and face the Indian Ocean, on its western edge lies Stone Town, the most atmospheric city south of the Sahara. Rather than merely providing an alluring backdrop for film screenings, these resonant juxtapositions frame the films and videos shown during the Zanzibar International Film Festival (ZIFF), even as those productions themselves refract the complex historical and present experiences of the island. The organisers of the sixth ZIFF, held from June 28 through July 12, 2003, strove to maintain this broad reach for their event. Formally titled the “ZIFF Festival of the Dhow Countries”, after the elegant, often high-sailed seagoing vessel known as the jahazi or dhow, the festival presents cinema as one of many expressive practices and institutions that constitute and reflect the dynamic culture of the region. The dozens of performances this year included the devotional (but very danceable) music of Sidi Goma, a tribal Sufi community from India with African origins; percussionists from Tanzania and Uganda; contemporary hip-hop artists from Dar es Salaam; and the Zanzibari music perhaps best-known in the West, the traditional local taarab of Cultural Musical Club. Workshops, too, were held on topics ranging from local textile design to Indian classical dance and from the East African filmmaking business to more scholarly deliberations on the special challenges confronting women in society and in filmmaking. A lively, two-day long seminar was also devoted to one of the two tensions – or, better, encounters – most prominent at the sixth ZIFF: that between the Swahili culture of the East African mainland and that of the Indian Ocean region as a whole. Not surprisingly in an island society shaped over centuries by this very mixing of ethnic groups and creative practices, the encounter was addressed with sophistication. Zanzibar, after all, was a Portuguese trading port before becoming an Omani colony and then a British Protectorate (as mainland Tanganyika was formerly German East Africa). Many participants in the seminar accordingly questioned fixing any essential cultural characteristics and remained sensitive to the status of hybrid culture as more than the sum of its influences. A few voices did call for greater respect for specific Swahili or Muslim traditions, particularly for maintaining the putative integrity of expressive traditions in music or storytelling, but most sought not to dwell on the contest between these influences so much as to explore and celebrate their synthesis. Such celebration of culture – understood here to encompass specific practices and institutions that enact and perpetuate group identities, traditions, beliefs, and values – is a professed aim of the festival as a whole. Besides the explicit attention to performing and creative arts, though, the program addressed the social realities of the region which themselves interact with, and are reshaping, local culture and ways of seeing. One festival emphasis this year was the world as seen through the eyes of the young. A wonderfully textured short, Waiting for Valdez (Dumisani Phakathi, 2002), offers a view of a young coloured boy in impoverished, Apartheid-era South Africa who simultaneously enjoys a warm relationship with his grandmother and exhibits a profound sense of hope for the future (dramatised by the opening of the Burt Lancaster Western, Valdez is Coming [Edwin Sherin, 1971]). Another festival theme was the place and vision of women. Nalaika is Coming (Albert Wadago, 2002) follows a young woman’s journey away from her family – and the choices of employment and arranged marriage they presume to make for her – toward an independent life in Nairobi. Sita’s Family (Sita Devi, 2002) focuses still more directly on the struggles and ambivalences of family in establishing a woman’s identity: this Indian production is a personal journey through memories of childhood and of female relationships, especially between the filmmaker and her deceased mother, who was a prominent political figure. Family expectations are also complexly entangled here with social traditions. The Algerian film, Rachida (Yamina Bachir-Chouikh, 2002), tracks a young teacher as she walks to work one morning without wearing her chador (the full-length garment worn by many Muslim women) and is set upon by terrorists – including one of her students – who order her to take a bomb into school; the resulting struggle of wills is extraordinarily well-conceived. Though not explicit thematic threads, a variety of fundamentalisms and extremisms (religious, political, social) probably more familiar to U.S. or European viewers did inform many of the films screened. And Along Came a Spider (Maziar Bahari, 2002) is a chilling documentary about an Iranian serial killer of women unapologetically certain of the Islamic justification for his acts. Shot in Nagpur, India, Lalit Vachani’s The Men in the Tree (2001) revisits boys who were first seen eight years earlier in a previous documentary, The Boy in the Branch (Lalit Vachani,1993) being indoctrinated into the increasingly influential Hindu fundamentalist organisation, the RSS. Every bit as disturbing were treatments of the ongoing tragedy in Zimbabwe – especially Zimbabwe 2002, Farai Sevenzo’s brief but horrifying account of the betrayal of that country by Robert Mugabe culminating in the most recent elections; Zimbabwe Countdown (Michael Raeburn, 2002); and My Land My Life (Rehad Desai, 2002). Other recent and ongoing conflicts in sub-Saharan Africa – from the Rwandan genocide to the protracted struggles in the Congo to the legacy of apartheid – also received treatment here, in haunting films like Dommie Yambo-Odotte’s Aftermath (2002), which highlights the suffering of child soldiers in Sierra Leone, or Voices Across the Fence (2002), Andy Spitz’s short account of the impact of war and displacement on Mozambican refugees in South Africa. Even in these productions about overtly political subjects, however, the effort is more to engage human-scale perspective than to advance sweeping glosses of contemporary social conflicts or clashing civilisations. That said, the emphases on the individual or local in many of the screenings also connected to aesthetic and political concerns shared by those outside a given region. Several films shown at ZIFF are current staples of a global festival circuit marked by contemporary transnational film and media production and distribution, which also contributes to a blurring of boundaries between mainstream, festival, and arthouse cinemas. Among these titles, which play in what has been described as the “diaspora multiplex”, are City of God (2002), Fernando Meirelles’ saga of brutal Brazilian gangs; Nowhere in Africa (Caroline Link, 2002), from Germany (the most recent Academy Award winner for Best Foreign Film); the Australian drama; One Night the Moon (Rachel Perkins, 2001), about an Aboriginal tracker; and Amandla (2002), Lee Hirsch’s tribute to the role of music in the three-decades-long South African struggle against apartheid. In terms of the festival’s professed celebration of intercultural encounters and interactions, one might fairly employ the term, “global South” to convey the provenance and politics of many of the films screened in Zanzibar this year. That broad rubric, defined by its distinction from the global North, emphasises the contemporary cultural, political, and especially economic divisions that transcend the national and post-date the ideological tensions oriented by the Cold War. To speak of the global South, then, demands not only thoughtful engagement with modern identities, political boundaries, and technological forms like cinema marked by inequity and dependence, but also their critical repositioning within a new global economic and media geography. If global South and North are often contrasted in the stories projected on screen, directly or indirectly, discussions around the festival likewise assumed an immediate, grounded, and often personal character, refreshing for a U.S. interlocutor used to the ritual academic invocations of theories opposing the homogenising tendencies of the global North and the local conditions and practices of the South. Tanger, Le reve des bruleurs [Tangier, the Burners’ Dream] (Leila Kilani, 2002) documents the quest – seemingly beyond reason and even at the potential cost of life – of Africans to cross the Gibraltar Straits to the promised land of Europe. Anansi (Fritz Bauman, 2002) likewise relates the sustained, often methodical, sometimes obsessive efforts of West Africans to reach Germany. The texture of these films belies the ready abstractions that distant observers of Africa might bring to experiences here. In other words, while many films at the festival problematised the local, they did so not as much through direct contrast with unremitting global forces as by highlighting the transnational quality of contemporary life. Instead of journeys from south to north, recurrent here were narratives of dislocation, border crossings, and individual identities marked by overlapping social and political allegiances. Dream of Flight (2002) Nacim Pak’s study of Iranian asylum seekers in the west of Turkey, focuses on the midway houses where the seekers must stay while awaiting approval of asylum and which also generate anxiety and fear among the locals surrounding them. American Exile (Herman & Shrout, 2002) is about a former Black Panther member from Kansas City, now living in Tanzania, seeking to have his conviction from 1969 (for transporting a shotgun across state lines) overturned so he can return to the U.S. The very complexity of these conditions precludes any renderings of African experience as simply juxtaposed with the encroachments or distant allures of America and Europe. Thus, while it is appropriate to cite the encounter between Swahili and Dhow cultures, on the one hand, and between local and global, on the other (as your reviewer is doing here), such attention must embrace 21st century fluid identities rather than continuing to fixate on static and sanctified categories like the nation-state or religion. 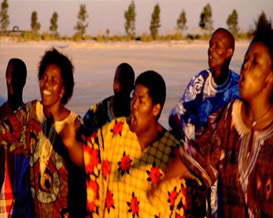 Consider, too, the recipient of the festival’s “Golden Dhow” for Best Documentary Video, Rhythms from Africa: Zanzibar: An Ocean of Melodies (Abdulkadir Ahmed Said & Bridget Thompson, 2003). A celebration of the evolution of taarab music, the film concludes by questioning the future of the performance-based musical form in the face of recording and, especially, its competition from imported forms like disco – often Western, but also Arab and Indian – popular with young people. Besides bringing the predominantly local crowd to its feet dancing (in what is surely one of most glorious film screening sites in the world, the open-air amphitheater inside the 19th-century seaside fort in Stone Town), the production speaks directly to the festival concerns with the geographical specificity of cultural practices, of technology, and of generational taste in the face of tradition. Three other entries here employ the title, Rhythms from Africa, and discuss music across South Africa and, specifically, in Cape Town and Johannesburg, and each underscores the complex and historically shifting local versions of musical syncretism. These titles unavoidably suggest parallels between the fortunes of music and those of cinema itself. Perhaps most obviously, the prevalence of documentary and ethnographic productions at the festival draws attention to the claims of truth or transparency made by many filmmakers in their presentation of African lives and experiences. This matter of documentary “transparency” is more than an aesthetic preoccupation: at issue are social and political questions about the possibility and appropriateness of recording and preserving, or even extending and adapting, the past and tradition to contemporary experiences. One might consequently ask, amid the broader discussions of local or regional cultural practices encouraged here, whether the status of film or video in the dhow countries is different from elsewhere in the world. Moreover, are these media that, particularly when deployed in the region by indigenous filmmakers or those from outside, offer a more authentic vision of life or one that is somehow reconfigured by the camera? Such questions about the politics of identification and interaction are also readily observable in the festival exhibition of films, where opportunities for identifying with, and sharing, cultural and intercultural experiences occurred through film viewing, affirming cinema as a modern technological medium of individual and group expression and participation. The centerpiece film of ZIFF 2003, Heremakano/Waiting for Happiness (Abderrahmane Sissako, 2002), is a French-Mauritian co-production that touches on many of the issues raised by other festival performers and screenings. It relates the experiences of Noudadhibou, a Malian who finds himself on the West African coast of Mauritania awaiting his departure to Europe. Unable to speak the local language, on a peninsula between sea and desert, Noudadhibou observes and interacts with locals who seem both fascinated by his presence and, immersed in their own activities, indifferent to him. But more than a straightforward political statement, Sissako’s film creates a dreamscape in which the limbo of exile and the hope of the journey converge. The poetic vision of Mauritanian village life avoids, and also calls for reflection on, the linear stories of transit and cultural encounter familiar elsewhere. Such a meditation epitomises the necessary range of storytelling and cinematic strategies in play in relating contemporary transnational experience. On another, institutional and industrial level, Sissako’s film is a co-production that calls attention to the distribution alliances and promotion by governments and non-governmental organisations behind many of the films here. The festival itself is sponsored by the Tanzanian government, UNESCO, and the Ford Foundation. Reflecting the complexity of many of the narratives featured at ZIFF, the production histories and industrial affiliations of the films here blur manageable assignments of national origin or film industry. While consistently the work of filmmakers from Africa or the Indian Ocean world, many of the films have credits conspicuously revealing the complexity of their production and urge the replacement of notions of originary purity with those of hybridity. Films at ZIFF about the AIDS pandemic, which included The Widows of Shinyanga (Suvi Andrea Helminn, 2002), Night Stop (Licinio Azevedo, 2001), and Simon and I (Beverly Palesa Ditsie, 2001), are illustrative. The latter two films belong to the multi-nation “Steps for the Future” project of more than 40 films about living with HIV and AIDS, made by Africans but largely financed with capital (and, in cases, produced with technical support) from Europe. These hybrid production histories foreground a second encounter – between dhow countries and the worlds of Europe and the United States – threading through much of the ZIFF program and further situating it as a festival of the global south. Paralleling the stories of particular human concerns played out against multiple and shifting local, regional, and global backdrops in the screening program are thus accounts of the industrial and trade policies and practices enabling the films’ production and distribution. Moreover, like an appreciation of the geography and rich history of Zanzibar itself, such cultural and economic mapping allows fuller tracking of the particular forces and influences shaping films in, and of, the dhow countries. It is an unfair (and probably undesirable) test of any film festival that its program be entirely coherent thematically. Even more, it is unrealistic to expect the screenings and, where offered, ancillary events to illuminate the core issues, tensions, and problematics of a given milieu or cultural identity. Yet by both standards, ZIFF 2003 was a remarkable achievement. By foregrounding the relation of cinema to broader questions of social values and cultural institutions, and, in doing so, remaining mindful of the particular tensions informing Zanzibari, or at least East African coastal, social life, the festival voiced fresh possibilities for approaching the complex subject of contemporary transnational cinema. That the event did so by effectively mapping the specific situations of the cinemas and other creative forms constituting dhow culture demonstrates the promise of such an approach for exploring a fuller range of contemporary transnational film productions and industries.